PEM050 electronic stepper pumps accurately dispense 1-50 ml of corrosive media in Teflon® PTFE fluid paths for chemical replenishing, blending, dosing, and spiking applications. These reliable pumps feature fully-supported rolling diaphragms, which maximize discharge pressure capabilities. Positive control valves ensure accuracy by eliminating the variability that is typical of check valves. They offer up to 5 discharge ports that can be independently controlled with programmable system logic. 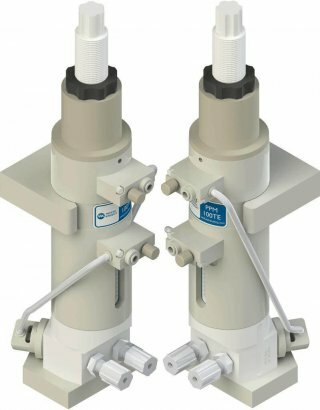 PPM100 pneumatic metering pumps accurately dispense up to 100 ml of high-purity chemical in a Teflon® PTFE fluid path. It operates with a fully supported rolling diaphragm to maximize discharge pressure capabilities. Two positive control valves ensure accuracy by eliminating variability that is typical of check valves. 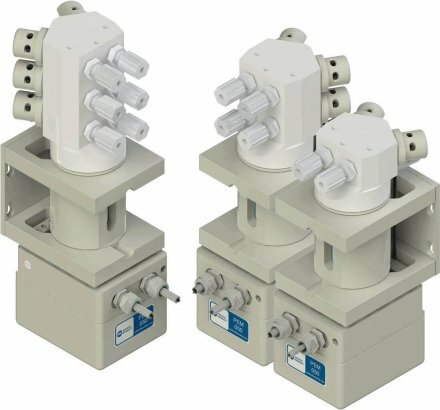 White Knight metering pumps offer adjustable flow rates for use in single-wafer processing tools or premix vessels to ensure exact chemistry mixtures, and allow for in-situ mixing directly at the head. The pumps accurately dispense high-purity chemicals for replenishing, blending, dosing and spiking applications, as well as cleaning CVD equipment and in photolithography. They are ideal for photoresist, etch and clean processes, peroxide spiking in piranha mixtures, and other blending of chemical mixtures into process tanks prior to the introduction of substrates. *Suction lift diminishes over time. Recommended installation level less than 4.6 m (15 ft) above source. **Optimized parameters can improve repeatability (up to ± 0.01%). Minimize suction lift to maximize repeatability. Tests conducted with water at ambient temperature. Dispense range measured at full stroke with maximum and minimum supply pressures at 80 PSI and 60 PSI. Contact White Knight for details. Standard communication is Serial RS422. Option H1 is only available with E3 or E4 Turck connector Electrical Connection. H1 cable length matches the selected E3 or E4 cable length. Option H2 only available with E4.